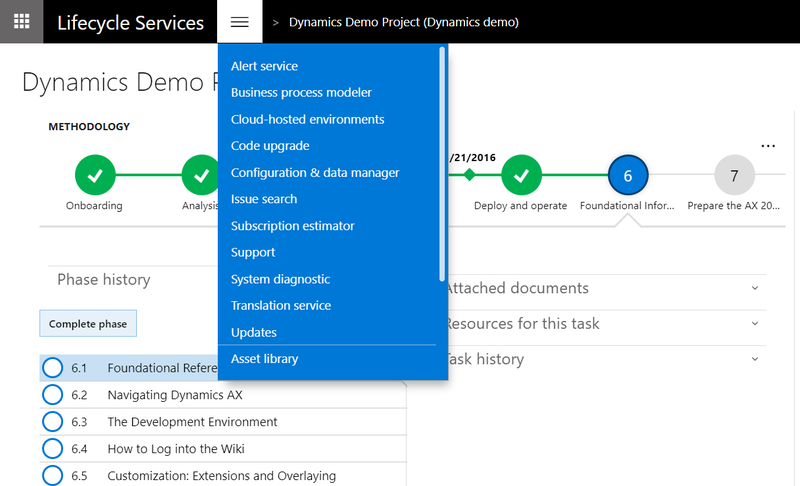 Subscription estimator is a tool that is available in Microsoft Dynamics Lifecycle Services (LCS). Microsoft uses this tool to estimate the initial size of the production environment that must be provisioned for a customer. Before customers can request deployment of a production environment, they must estimate their peak workloads in terms of transaction counts and then upload that information to LCS. By using the details of user licenses and transaction counts to infer subscription requirements, the Subscription estimator tool helps ensure that the provisioned environment meets the customer's business requirements. Follow these steps to use the Subscription estimator tool. In LCS, open the project that is associated with the implementation project for Finance and Operations. At the top of the page, select the hamburger icon, and then select Subscription estimator. Download the sample usage profile. Answer the required questions on each tab. If you're a Retail customer, be sure to answer the questions on the Retail and Commerce tab. Save the usage profile locally. To upload the usage profile, select New estimate, name the estimate, and then upload the usage profile. After the upload is completed, select Mark as Active to activate an estimate. An active estimate is required in order to configure a production deployment. When there is a valid active estimate, the Configure button becomes available. You can use this button to request a production environment deployment. Although you can have multiple estimates, one estimate must be marked as Active. After the production environment has been deployed, or deployment of the environment has received sign-off, the active estimate is locked. To mark a different estimate as the active estimate, create a support request by using the Support portal in LCS. Question: Why isn't the Configure button for deploying a production environment available, even though there is an active estimate? And why does a warning message appear in the Action center on the project dashboard? Answer: If you have multiple implementation projects, the Configure button might not be enabled and a warning message will appear in the Action center regarding an insufficient number of licenses. Log a support request, and the support team can help resolve this issue. Question: Why does an error occur when I mark an estimate as Active? Estimate created but does not meet requirements – This error occurs if transaction lines that are entered aren't within the limits of the Subscription estimation tool. To resolve this error, create a support request, and attach the usage profile. Your instance can then be manually sized. If you receive any other error message or encounter any other issue, create a support request, and attach your active estimate so that the support team can address the issue.